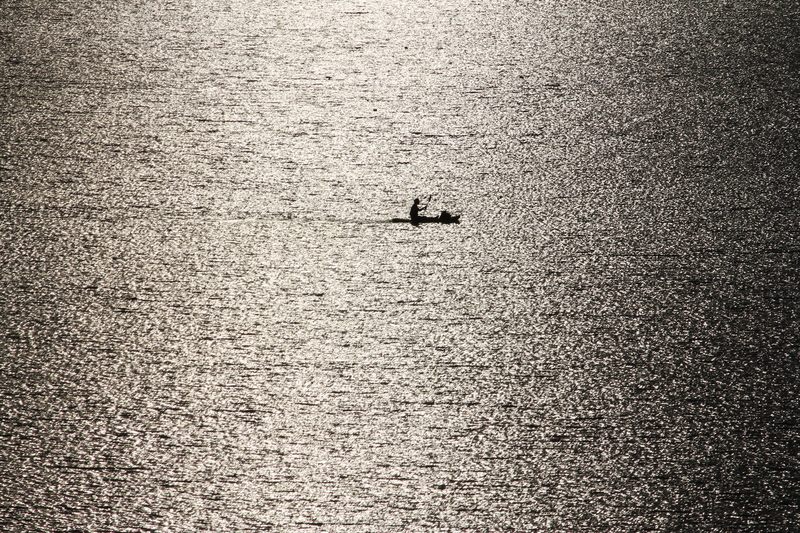 This lonely boatman was rowing his boat at the majestic Osman Sagar Lake in Hyderabad on a bright sunny day. Located on the outskirts of Hyderabad, this is a huge lake with an area of 46km², providing water supply to the city of Hyderabad. It is a very popular tourist spot in the city with many locals thronging the area on the weekends and sunset time, and especially on the rainy days when the grandeur is at its peak. Bright light created the silhouette of the boat and the boatman, which challenged the pattern of the huge expanse of the lake. It seemed as if he was the sole occupant of the lake, or let me say the king of the land (rather water). It looked very simple and minimalist to me when i clicked this shot. More photos of this week’s photo challenge – motion – here. This entry was posted in Life, Nature, Photography and tagged Black & White Photography, Hyderabad, India, Lake, Landscape, Life, Minimalist, Nature, Osman Sagar Lake Hyderabad, Photography, Silhouette, Silhouette against Sunlight, Travel. Bookmark the permalink. Hi Winny, Hyderabad is a beautiful city with very rich history and culture of its own. It is the melting pot of two religions – Hinduism and Islam. So you will find several beautiful and historical monuments in this city – CharMinar, Golconda Fort, Birla Temple. This city also boasts of several lakes, Hussain Sagar the most famous one right in the heart of the city. This city has treasured both kinds of world – modern and traditional. Though its a crowded city like any other city of India, you will find it has its own charm and places of serenity and tranquility. If you plan to visit India, you must come down to Hyderabad to get a feel of colorful and vibrant India. Hey Kat, yes I read your tweets and got to know of your trip. Iran, wow! So, which all places you been? Is it safe to go there with so much fighting going all around Iran? Hey Suyash, I wouldn’t have gone travelling to a place where there’s lots of fighting going on, right? 😉 Iran is indeed SAFE. The fighting is in Iraq. They are 2 different countries, though they are located next to each other. Cheers. Yes, indeed. Located far from the city and all the hustle bustle of a city, this lake is very peaceful. Unfortunately, the land sharks and real estate guys have already come very close to this lake and I hope government will stop the encroachment of this beautiful lake. Thanks a lot Aqui 🙂 This was the shot I clicked a couple of years back when I was in India. Como Estas? Is it getting colder in Buenos Aires now? make you feel very nostalgic!